I ordered karahi.. it was smelly. written by Shameen Arshad on Jan. 19, 2019, 3:17 p.m. If you want tender chicken or beef with cheese or mayonnaise and bits of freshly grated vegetables rolled in a paratha, then Karachi Red Rock is your ultimate choice. Its deliciousness will sweep you off the ground. But, how can you get a paratha roll delivered to your destination? Of course, its food delivery partner, Cheetay can get your most craved for meal as rapidly as it claims. It is quite interesting to see a variety of paratha rolls that you can order online. If you scroll through the menu, you will realize that you have the power to make your own meal and not just choose from the usual. You can get Chicken paratha roll with assortments such as Bihari Mayo, Bihari Cheese, Malai, Breast, Jumbo, Zinger, Cheese Double Slice, Chat Pata, German, Kebab, Kasturi, Double Kabab, Seekh Kabab, Pasha, Jumbo Cheese, Jumbo Mayo and Platter. If you like beef or mutton more than chicken then go either for simple Beef, Mayo, Single Kebab, Single Cheese, Beef Double, Beef Cheese Slice, Chat Pata, Special, Rabic, Double Kebab or Double Cheese. Take a look at the simple parathas if a roll does not offer you much. These parathas layered with ghee could have your favourite fillings or could come with complementary dishes. These include Chicken, Beef Cheese, Aloo Anda, Chicken Anda Cheese, Simple Cheese, Beef, Beef Anda, Aloo Double Cheese, Chicken Double Cheese and Simple Anda Paratha. These parathas can become a delicious breakfast, an extraordinary lunch or dinner. A flaky, flavoured and crispy paratha is a traditional recipe that fascinates not only the locals but also foreigners so when you invite those who want to try desi food, order Karachi Red Rock from Cheetay. Do you know that this restaurant does not only offer you a long list of parathas and rolls but also other Desi food such as Chicken and Mutton Handi, Karahi, Bar B.Q, Takka Tak, Biryani and Chicken Balochi Saji? The most popular dishes out of all these include Chicken Karahi and Chicken Biryani. These deliciously spiced, aromatic and flavourful dishes are a treat to the eyes as well as the stomach. 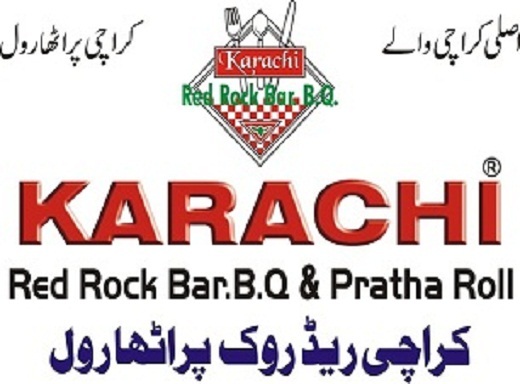 Besides this, Karachi Red Rock’s menu also has Makhni karahi, Cheese Tikka Karahi, Desi Ghee Karahi, Mutton Cheese, Mutton Desi Karachi, Chicken Kebab Masala, Chicken Cheese Karahi, Drum Sticks, Makhni Drum Sticks, Makhni Tikka, Tikka, Chicken White Karahi, Mutton Karahi, Beef Kebab Masala, Chicken Qeema Masala, Wings, Drumsticks, Kasoori Cheese Boti, Pasha Boti, Chicken Green Boti, Tikka Boti with bones, Chicken Malai Boti, Tandoori Roast, Tawa piece, Chicken Cheese Piece, Chargha, Beef kebab, Takka Tak Tawa Piece, Tawa Boneless, Gurda, Mutton Qeema, Mutton Champ, Saji, Naans, Mutanjun and Zarda. It also has continental dishes such as Drum Sticks, Stuffed Chicken, Chicken Nuggets, Honey Wings, Buffalo Wings, Garlic Wings, Cheesy Wings, Mayo Wings, different types of Shawarmas, Burgers, Sandwiches, Soups and a range of Chinese. So, now that you have a world of food ready to be catered to you, all you have to do is decide what your favourite food and cuisine would be and click from Cheetay’s online store and get it delivered.